Honestly, I thought that we disposed of the neck circles long, long time ago. In every anatomy training I ever attended – college courses, personal trainer certification, yoga trainings – I was told that it is not a good idea to roll the head, especially backwards. However, recently I’ve moved to a new city and it seems that in every class I attend – yoga, exercise or dance – I am invited to do neck circles. Which made me wonder – what is going on? Below are some potential risks associated with neck circles, but first let’s take a look at what the cervical vertebra looks like. Each one of us has seven (C1-C7). (Fun fact: most mammals have 7 cervical vertebrae, whether it’s a human, mouse, giraffe or whale). In humans, C3-C6 are relatively similar in shape, but C1, C2 and C7 are unique because of their function/position. The body of the cervical vertebra (the bony part) is small relative to the vertebral foramen (the opening that accommodates the nerves of the spinal cord). The spinal cord is a long, thin bundle of nerves that extends from the brain and is enclosed and protected by the vertebral column. Compared to the size of the cervical vertebrae, your head is fairly massive. 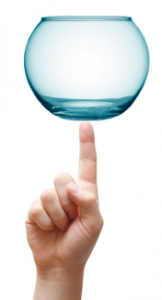 It sits on top of the cervical spine like a fish bowl on the tip of a finger. Because of this arrangement, small muscles can produce significant effects by tipping the balance one way or another. And that is also the reason that multiple muscles and restraining ligaments guard the range of motion of your head, preventing it from going too far. In your day-to day life you move your head in a very predictable pattern, which is also the safest. It is natural for your head to move in a linear fashion. Circling the head is NOT a natural movement for the neck. When you move the head in an artificial circular pattern, you override the protective mechanism that your body has in place. Because of its delicate nature, the spinal cord needs to be isolated from bumps and blows – the task accomplished by the vertebral structures and surrounding ligaments, tendons and muscles. In addition, the spinal cord needs to be protected from the surrounding bony wall of the vertebrae themselves. The bony spinal canal normally has more than enough room for the spinal cord, but sometimes it can become smaller/narrower (called spinal stenosis). When that happens the bony structures of the vertebra can compress or pinch the nerves, which will show up as weakness, numbness or pain in the neck itself or anywhere along the nerve’s pathway. Some people are born with a spinal canal that’s narrower then normal, which puts them at a greater risk even from a minor neck injury. The effects of aging (thanks, Mother Nature!) – wear and tear on the spine can cause all kinds of degenerative changes, including disk herniation, bone spurs and cartilage degeneration. Any of these conditions can narrow the spinal canal. Too much movement between vertebrae, which can cause the neck bones to shift and close off the spinal canal. Here is the thing – you never know what’s going on in your students’ cervical spines. They might not know it themselves (many people have stenosis without any symptoms). Rolling your head back puts the neck in the most vulnerable position – the combination of hyperextension and twisting and/or rotation. For somebody who has spinal stenosis this can lead to nerve compression and impingement. Your vertebrae are stacked on the top of each other and their bone protrusions fit together kind of like Lego pieces to form facet joints. Those joints move in a hinge-like pattern and their surfaces are covered with cartilage to make the movement smooth. These joints allow flexion (bending forward), extension (bending backward), and twisting motion and prevent excessive bending and gliding movements between adjacent vertebrae. The spine is made more stable due to the interlocking nature of the adjacent vertebrae. These joints play a major role in the preservation of “normal” range of motion. Since the circular motion of the head is not a “normal” movement and encourages the vertebrae to “glide” against one another, it can destabilize the facet joints and cause unnecessary wear and tear on the structure. This is made worse by the fact that these joints are weight-bearing, which makes them more susceptible to degenerative changes. Neck circles can cause further damage to an already degenerated cartilage surface. And didn’t we say earlier that spinal instability could also lead to the narrowing of the spinal canal? Doesn’t sound like a responsible thing to do. Reason 3. Restriction of the blood supply to the brain. Your brain, with billions of neurons, is an extremely active organ with a continuous demand for nutrients and oxygen. 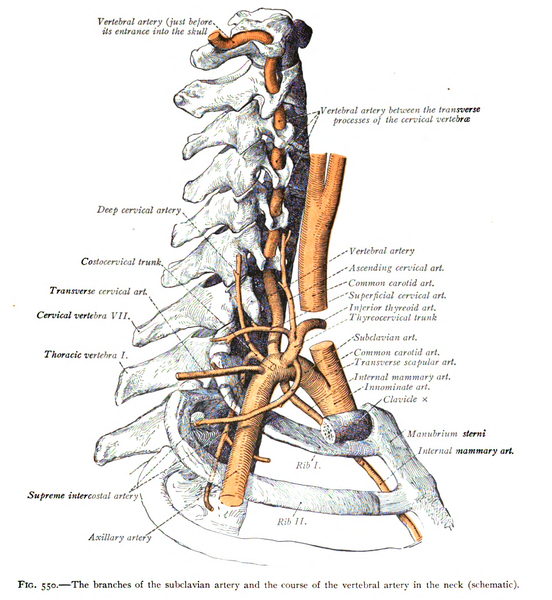 These demands are met by an extensive circulatory supply through the internal carotid arteries and vertebral arteries. In the extreme case, a stroke occurs when the blood supply to a portion of the brain is shutoff. When you move your head back beyond the point of just looking up, you can put pressure on the vertebral arteries and with that reduce the blood flow to the brain. The situation gets worse if the arteries are clogged. The result – dizziness, maybe even loss of consciousness. It seems obvious that neck circles are not safe and can cause all kinds of problems. Certainly, the likeliness of that happening depends on the variety of factors: student’s age, underlying spinal issues, the frequency of the activity, etc. But it seems that in this case the potential risk far outweighs the potential benefit (neck stretching). And to tell you the truth, I am not a big fan of isolated neck stretches, even if they don’t involve head circles. I just don’t think that they are very effective. There are better ways! What are the better ways to stretch the neck? What about half circles? Like a number 8 from above….I was taught that in Kundalini yoga. Inhale to look up – half circle back to the front and then other side. It feels better than full circle for sure but would like your opinion about it. Hi Rita! My understanding is that it’s better to do a half circle from shoulder to shoulder (through the front); and if you want to take the head back, it’s best to move it front-to-back in a straight line, rather then half circle. I hope this helps! Zoals dat hier afgeschilderd staat zou ik beschadigde halswervels hebben. Ik doe de hoofdrol al 40 jaar, ben er nu 66. Ben begin dit jaar van meer dan vier meter hoog op mijn nek gevallen en God zij dank niks aan mijn nekwervels of wervelkolom. Het is natuurlijk belangrijk op welke manier je de hoofdrol (nek rol) uitvoerd. Dat is een ander paar mouwen. This opens up your throat chakra channel… What are you talking about?? i would like to put all this information into 1 yoga session and then talk about one part at a time the following sessions.Can you point out the most important shocking points .I have my ideas and I really want to also educate the instructors. All those reasons sound pretty interesting, but is there any actual research about the danger of taking advantage of your neck’s range of motion? Or how about showing a few examples of some people who got a nerve impingement from rotating their neck? I have yet to hear anything about that, nor have I seen any studies. But what I do know, is that people who let their necks go (by not exercising their range of motion) get all sort of health issues. I mean, think about it. Is looking over your shoulder, looking up or looking down is bad for your neck? No. So why would any rotation be bad for it? Of course don’t do things if they hurt, but why avoid movement if it gives zero complications during or after? The stronger your neck muscles are, the healthier your neck is. And you can’t get a strong neck whiout utilizing your neck’s natural range of motion. yes yes and yes Alex! Our bodies are not stupid, it will not give you a pain free range of motion like neck circles if you are not meant to do it. These sorts of posts are just create fear of movement! do neck circles I have been doing them my whole life and never had any neck issues ever!!!! I was doing neck rolls and also back bends, during one backbend I felt heat in my head and in my ears, I didn’t lose my balance, I think I blacked out, I wound up on the floor ! I ignored my body’s message and kept doing the backbends until I saw my yoga teacher yesterday and she told me why I shouldn’t go them. Finally I got the message. I won’t do either backbends or neck rolls. Previous story Yogic breathing: chest to belly or belly to chest; what is the proper breathing technique?